Novena to the Queen of Peace will start on Wednesday, June 15, 2011. Every day, including Fridays, there will be Rosary on Apparition Hill at 4 p.m. The evening prayer programme will start at 6 p.m. with Rosary and Holy Mass at 7 p.m. Every evening during Novena there will be Adoration of the Blessed Sacrament from 10 p.m. to 11 p.m. and from 8 p.m. to 9 p.m. on Thursdays and Fridays. This Novena is the opportunity for us to give thanksgiving to the Lord for all of the graces he had bestowed upon us through the intercession and presence of our Heavenly Mother over the last thirty years. Eighty children received the sacrament of Holy Confirmation in Medjugorje on Saturday, May 28th. This sacrament enriches those who have been baptised with the gifts of the Holy Spirit and renders the bond with the Church more perfect. Local bishop Monsignor Ratko Peric administered this sacrament at the Holy Mass at 10 a.m. In his homily that was directed to the recipients, their godparents and parents, he explained the excerpt from the Acts of the Apostles about the events that took place during the second mission journey of St. Paul. The sacrament of the First Holy Communion took place on Sunday, May 1st, 2011 at 10 a.m. in the church of St. James in Medjugorje. After being prepared through the religion classes in the last few months, finally seventy-four children received this sacrament, 42 boys and 32 girls from Medjugorje parish. Parish priest, Fr. Petar Vlašić, was the main celebrant and celebration was even more beautiful thanks to the lovely singing of children's choir „Doves of peace“. Apart from this solemn event, the atmosphere in Medjugorje is very uplifting thanks to numerous pilgrims from Austria, Germany, Switzerland, the United States, England, Ireland, Italy, France, Korea, Slovenia, Belgium, Libanon, Spain, Poland, Portugal, Canada, Slovakia, the Czech Republic, Hungary, Croatia and Bosnia and Herzegovina. Holy Thursday, April 21, 2011 – On this day when Church remembers institution of Holy Eucharist and Priesthood, it is allowed only to celebrate Holy Mass of consecration of the oil and Holy Mass of Lord’s Supper. Holy Mass of consecration of the oil can be celebrated only by bishop in his cathedral. Therefore, on that day before noon, in Medjugorje there are no confessions and no Holy Masses celebrated. Prayer of the Rosary begins at 5 p.m. and solemn Holy Mass of Lord’s Supper at 6 p.m. After Holy Mass there will be Adoration of the Blessed Sacrament, and all faithful will have opportunity for silent prayer until Midnight. There is also opportunity for sacrament of Confession from 4 to 6 p.m. The tradition from the past in our Diocese is that faithful pray from the Fifth Sunday in Lent until Palm Sunday to prevent cursing and blaspheming of God. All parishioners and pilgrims have been invited this week to offer up all of their prayer intentions, especially the prayer of the Way of the Cross on Friday, as atonement to God for all of the sins caused through cursing. Palm Sunday is the beginning of the Holy Week, the highlight of the preparation for the Feast of Resurrection. The Holy Mass on Palm Sunday will start at 10.30 a.m. at the ruins of the old parish church. The procession will go from there to the church of St. James, where Holy Mass is going to be celebrated. There will be also two other Holy Masses in the Croatian language, at 8 a.m. and 6 p.m. in the evening. The blessing of the olive and palm branches will take place at all of those Holy Masses. The Rosary at Apparition Hill will be at 2 p.m.
On Tuesday, April 5, 2011, Raymond de Cordona, the Ambassador of the Republic of Italy in Bosnia and Herzegovina, and Giuseppe Pizza, the Minister for the Scientific Research of Italian Government, presented Italy at the opening of the 14th International Economy Fair in Mostar. 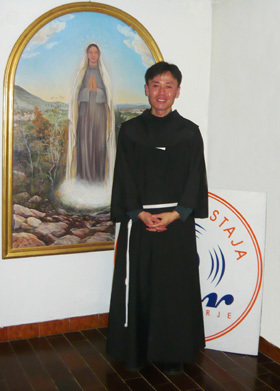 They visited Međugorje on the same day and parish vicar, Dr. Fr. Miljenko Šteko, welcomed them on the behalf of Herzegovina Franciscan Province. In his interview for radio station “Mir” Međugorje, Giuseppe Pizza said: “I wanted to use this little time I had prior to my return to Rome, so I could pray in this famous shrine where I came for the first time. I am impressed with simplicity of this place and with hospitality of the people. This is indeed a special place and it is well-known throughout the whole Europe.” He added how Italy has a great devotion to Our Lady and that he is very proud that Italians are amongst the most numerous pilgrims in this place of prayer. “I came here for just a short period of time, but I would like to come back and spend all day here. One can truly feel peace and it is not surprising that Italians come in such a great number”, said Mr. Giuseppe. Numerous pilgrims arrived to Međugorje in the beginning of April. Due to the large number of pilgrims, and thanks to the beautiful weather, the evening prayer programme was held outdoors, at the White Dome, on Saturday, April 2, 2011. The Information Office registered groups from: Mexico, Austria, Germany, the United States, Ireland, Italy, Hungary, Spain, Albania, Poland, Slovakia, Romania, and Korea. There were organised groups of Croatian pilgrims from the following towns: Šibenik, Split, Zagreb, Požega, Drvar, and many others. Anna Maria Brancatelli from Catania, Italy, said in her interview for radio station “Mir” Međugorje: “Pilgrims come to Međugorje bringing their own problems, sufferings and crosses. Many come in a very difficult state, and upon their arrival, I see how they completely change. I think it is a miracle that many of them join our prayer group as soon as they return home. People change and their families change along with them. Every pilgrim comes back again with at least ten other people. This time we had two major conversions in our group”, she said at the end of the interview.